We established an equation of state for nanocrystalline forsterite using multi-anvil press and diamond anvil cell. Comparative high-pressure and high-temperature experiments have been performed up to 9.6 GPa and 1,300°C. We found that nanocrystalline forsterite is more compressible than macro-powder forsterite. 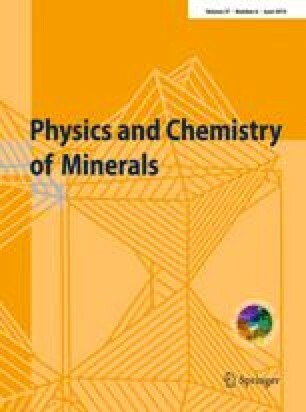 The bulk modulus of nanocrystalline forsterite is equal to 123.3 (±3.4) GPa whereas the bulk modulus of macro-powder forsterite is equal to 129.6 (±3.2) GPa. This difference is attributed to a weakening of the elastic properties of grain boundary and triple junction and their significant contribution in nanocrystalline sample compare to the bulk counterpart. The bulk modulus at zero pressure of forsterite grain boundary was determined to be 83.5 GPa. Research is supported by NSF research grant EAR-0711321. The authors would like to gracefully thank S-I. Karato for his useful comments. H.C. would like to thank V. Musaramthota for his help in the synthesis of nc-Fo sample. Use of the National Synchrotron Light Source, Brookhaven National Laboratory, was supported by the U.S. Department of Energy, Office of Science, Office of Basic Energy Sciences, under Contract No. DE-AC02-98CH10886. Use of the X17B2 and X17B3 beamlines were supported by COMPRES, the Consortium for Materials Properties Research in Earth Sciences under NSF Cooperative Agreement EAR 01-35554 and by the Mineral Physics Institute, Stony Brook University.